Find how to choose the best dining furniture in our guide. And once you've shopped, check out our guide to styling your bar cart like an interiors guru. With its painted gold bamboo frame and marble and mirror shelves, this trolley definitely nods to the Art Deco era. It’s also pretty sizeable, so if your alcohol stash doesn’t expand over three shelves, you could always double it up as as side table and use it for some handy extra storage. If it’s a civilised and simple vibe you are after, then this John Lewis & Partners’ offering is just the ticket. With smoked glass shelves and gold metal frame, this minimalist design is set on four castors so is super easy to manoeuvre no matter how many martinis you may have consumed. Has this bar cart literally just been wheeled out of Don Draper’s office? The walnut finish, rounded legs and brass details definitely recall the fifties and sixties aesthetic, just fill it with cut crystal glasses and all the ingredients for an Old Fashioned and you are good to go. Just be aware that it’s only on two castors so you will have to pick it up slightly to move it, so be careful not to overload it. Still love all things copper? Yep, us too. And lucky for us it’s a trend that doesn’t seem to be going anywhere so adding this glorious trolley to your interiors will definitely give your home an instant style hit. It’s pretty small, just 73cm high, so it's great if you want to add a touch a glamour to a small kitchen or living room. It also comes in a black nickel finish if you are all (completely understandably) coppered out. All the beauty of an antique but without the fragility, this gold trolley from Graham & Green is giving us all the Gatsby vibes. The generous gap between the two shelves is perfect for storing taller bottles (a flaw in a lot of bar cart designs) and the top is the perfect height for mixing drinks. If your drinks' selection is more on the modest side, this Dunelm drinks' trolley is ideal. Its two shelves will still hold plenty but the small dimensions mean it would easily squeeze into the corner of a living room or bedroom (no judgement here). We also think it's a bit of a bargain, looks pretty swish for under £150 don’t you think? 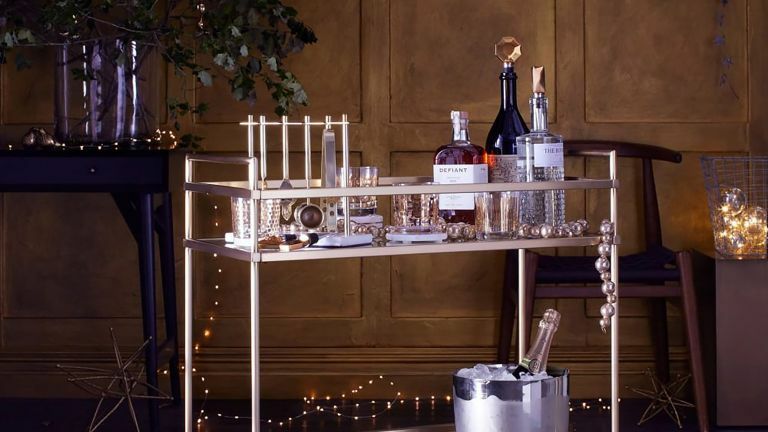 Four wheels, three shelves and two handles, this bar cart ticks all the boxes in terms of practicality and how easy it is to use, it also doesn’t look too shabby either. There is definitely something quite old school about the design, perhaps a little '70s, but that need not be a bad thing. It’s also under £70 and considering how pricey bar carts can get we reckon that’s a bit of a bargain. It could be argued that this is technically a kitchen trolley rather that a bar cart, but hey we say it's a great choice for those looking for a budget friendly, no frills option. Pile it high with fancy bottles and a funky looking cocktail shaker and no one will even notice you are trying to get that Mid-century style on a millennial budget. Top tip: You could always don your DIY dungarees and give it a bit of an upcycle with some metallic spray paint and marble contact paper. If you are looking for a vintage bar cart but found that they are eye-wateringly expensive this vintage – in inverted commas – metal trolley is your next best bet. Slightly less of a bar cart and more of a side table on wheels, this industrial style trolley has three roomy shelves – the bottom one is slatted which is a bit a pain, but why not add to the rustic look and fill some wooden crates with lemons and limes to make the most of the space. As much as we love a shimmering metallic bar cart with all the vintage-style trimmings, if you are looking for a more contemporary design, this Swoon Editions bar cart would be perfect. Its simple style is unfussy and practical – an understated background for all those glorious cocktails you are obviously going to be making. (And for all of you magpies, you’ll will be pleased to know it also comes in a gold finish).